20 « March « 2012 « Nothing in Biology Makes Sense! This post is a guest contribution by James Winters, the proprietor of Replicated Typo, a group blog about language and evolution. James holds a MSc in the evolution of language and cognition from the University of Edinburgh, and is contemplating going on for a doctorate. If you have an idea for a post, and you’d like to contribute to Nothing in Biology Makes Sense, e-mail Jeremy to inquire. “The formation of different languages and of distinct species, and the proofs that both have been developed through a gradual process, are curiously parallel… We find in distinct languages striking homologies due to community of descent, and analogies due to a similar process of formation… We see variability in every tongue, and new words are continually cropping up; but as there is a limit to the powers of memory, single words, like whole languages, gradually become extinct” (Darwin, 1871: 78-79). 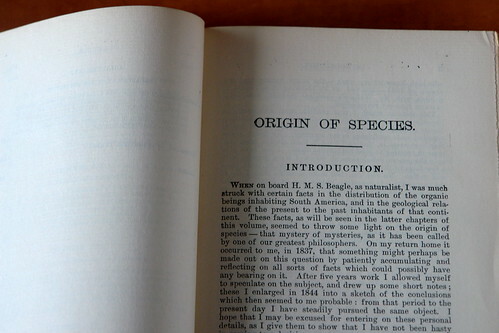 Darwin recognised, along with several other linguists of the period such as August Schleicher and Mikołaj Kruszewski, that language falls under the remit of evolutionary principles. Since then, there has been a renewed and growing interest in evolutionary (Croft, 2000) and ecological (Mufwene, 2000) theories of language change, with biological, cultural and linguistic forms of evolution being captured by the more general rubric of Complex Adaptive Systems. First coined by Holland (1992), CAS are a subset of nonlinear dynamical systems in that they exhibit emergent properties as a result of multiple, interconnected elements. However, it is the capacity to evolve and adapt that differentiates language and biology from these other systems, with the key concept being their ability to learn: past experiences filter through, or influence, future states of the system due to cumulative amplification dynamic (Deacon, 2010).